If you purchased from Hotel and the activation is done by hotel, all you need to do is to set the APN information on to your device. Please see APN setting page for details. Login to the User Page and enter your SIM card phone number and USIM number to login. 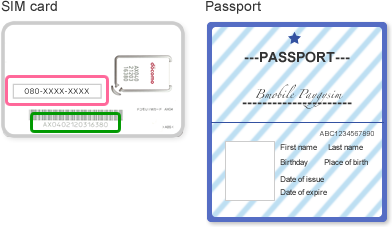 Register the requested customer information (information given in passport: name, birth date, passport number, address). Select your preferred PAYG SIM activation date and upload your passport picture (page with the photo of your face and your identification information). In case there is no passport bearer's address page in your passport, it is necessary for you to provide us with a different document that can be used to verify your address. In case you do not have such document, we will not be able to process your application. On the activation date, we’ll send you a notification email when your SIM card is ready to use. *Activation time depends on the subscription process. Insert the PAYG SIM card into your smartphone and set the APN information. For details please see the APN setting page. We will be sending you a confirmation notice by mail to the address which you registered. Note that if our confirmation notice is returned to us due to reasons such as "undeliverable" by the post office, we will suspend the use of your PAYG SIM. Login to the User Page and upload your passport picture which you used in Step1 as well as a picture of the page with the entry stamp in to Japan within 24 hours from your arrival. If you purchased the SIM card after 24 hours from your arrival, please upload the above two pictures within 24 hours from the activation date.